Hello friends, Are you ready? I mean, are you ready for THE turkey dinner? The holidays are so exciting and full of expectations. For me, it's the family get together that is most precious. I can hardly wait. Especially since my children are not exactly next door. We count our blessings everyday and I hope you do too. God is good. He is with us in all things and I am so thankful. Now onto today's card. My class created four Christmas cards at last weeks stamp camp. 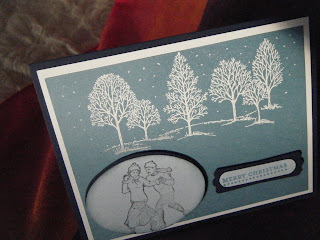 For this card we used two stamp sets. Winter Post and Lovely as a Tree. The trees are stamped with versamark and heat embossed with white embossing powder. The skaters are stamped using black Stazon. Some of the ladies stamped the skaters with Marina Mist ink. I like that they feel free to make changes where ever they want. In fact I encourage that, as I enjoy seeing their delight and I get to see a different way to create the same card. This was a fun card to make. No shopping list today. I have lots to do to get ready for our get together. In case you haven't heard, you should check out the fabulous deals Stampin' Up is having. For a limited time only. How about no shipping for Online orders of $150 or more. How about 50% 0ff on starter kits to become a demonstrator? If you choose to be on my team you will need my password. It is 'startup'. My Digital Studio is also 50% off. So hurry on over to my store and see what else is cooking. Oh, that reminds me I have stuff to do in the kitchen. Remember, you can shop as you are 24/7. It looks like the skaters are on their own little pond ! Thanks for sharing your class project.